These fractured, unconventional spins on classics provide a behind-the-curtain look at villains' acts of vengeance, defiance, and rage--and the pain, heartbreak, and sorrow that spurned them on. No fairy tale will ever seem quite the same again! With prompts provided by 13 popular BookTubers, 13 writers share stories that explore what it truly means to be a villain. From Medusa, to the giant Jack finds atop the beanstalk, to Death itself, the stories in Because You Love to Hate Me take villains old and new and make them the protagonists of their own stories. With such a variety of authors, there is, of course, variety in the stories included in this anthology. 'Gwen and Art and Lance' by Soman Chainani mixes the well known love triangle between Arthur, Guinevere, and Lancelot with the myth of Hades and Persephone, and tells the whole thing through text messages between high school students, Art, Gwen, and Lance. 'You, You, It's All About You' by Adam Silvera is told entirely in second person, making the reader the villainous protagonist. And 'Shirley & Jim' by Susan Dennard is a letter from Shirley Holmes to her best friend Jean Watson. With such a wide variety of genres and styles, it's obvious that not every story is going to be to every reader's taste, but it also means that there is likely something here for every YA fan. My favourites include 'Death Knell' by Victoria Schwab and 'Beautiful Venon' by Cindy Pon, two authors whose work I hadn't read before but will now certainly read again. For all the great stories, however, there are also more than a couple that I didn't enjoy as much. Some might have been better had they had more time to build, some styles simply weren't to my taste, and some just plain weren't villainous enough for me. For a collection based around the idea of villainy, there are a few stories in here that miss that mark a little bit, presenting protagonists that just don't really feel evil, but there are also plenty of protagonists creepy enough to send chills down your spine. 'Sera' by Nicola Yoon, is a favourite in that regard. The other element that makes this collection unique is, of course, the use of prompts from popular BookTubers. Each story is followed by a short essay from the BookTuber who prompted it, about the short story the reader has just read. Honestly, many of these feel redundant. A reader who has just finished reading a short story does not, in my opinion, need to be told what the story was about. A few of the essays are entertaining but for the most part, the anthology may have been stronger without them. 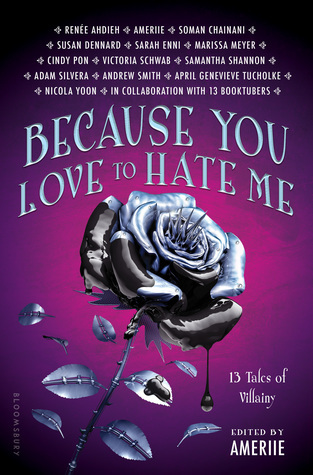 If you're looking for a collection of YA short stories that are a little different to what you might usually read, if you're looking to try out some new authors you've never read before, or if you simply love reading about villains, you will almost definitely find something to enjoy in Because You Love to Hate Me. Just don't be surprised if you don't enjoy every single story. But how often does that really happen with an anthology anyway?